Sorry, not of the sewing kind, that's all still a bit thin round here at the moment, but I am now a big step closer to starting my "maternity leave"!! 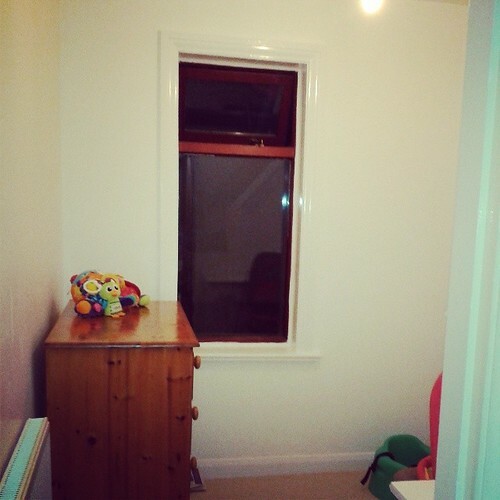 Remember when we moved house last year and I showed you the pictures of my teeny tiny fugly sewing room? Well, she's had a bit of a makeover. Unfortunately she is destined for no more sewing for a while, and needed to be fully stripped and re-branded as a nursery. My fantastic Mum came over for 2 days this week to give me a hand (i.e get it done as I am starting to run lower on spare energy), and within about 26 hours the conversion was finished (including fitting of new carpet). Still a little spartan at the moment, but I have a hoop for the wall, a quilty wall hanging in progress, and she should start to take shape and look a bit cuter and more baby appropriate. The cotbed is at the in-laws, and will be winging it's way here within a few weeks, I need to cover a lampshade, and the curtains and blackout blind need a bit of adjustment. And if I get a little spare energy those drawers will be getting the full paint treatment, no promises, as I have a big pile of kitchen cabinets to finish painting! I dare you to put the hoop I made on her wall and traumatise the wee bairn from birth. Well it looks better already. It's a shame you can't keep it as a sewing room, but I suppose you're have to give the baby somewhere to sleep! 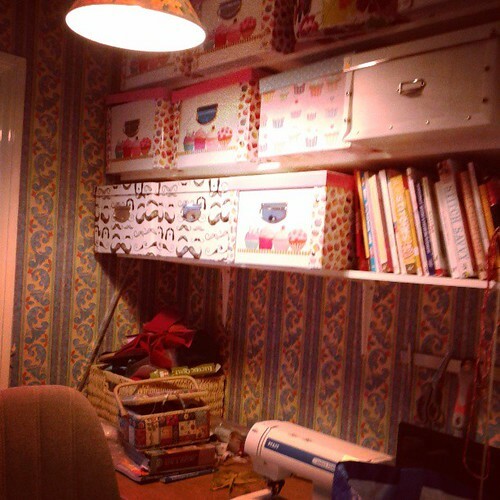 Ange I remember how I felt when my designated sewing-space-to-be had to be reassigned as the nursery for baby 2! Nearly 3 years on and I have reclaimed it so don't despair - your time will come! It looks like a really lovely room now - you have done a great job. Now relax! So not much left then ;o) Have fun at the guild meeting! The nursery looks fab Ange - must be time for you to relax now? !